Strong, romantic women’s fiction from this multiple bestselling author. In 1940’s Texas an African American soldier returns to his hometown after fighting in World War II. His bitter memories of his father’s murder there make it unlikely he’ll stay in town for long; but then he reconnects with the young white woman he loved as childhood friends. Racism, romance, drama. A terrific romance drama from a very beloved author. 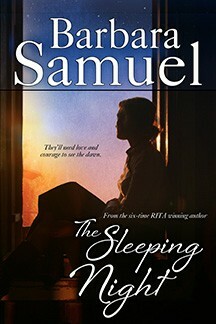 A triumphant tale of forbidden love that will delight Barbara Samuel’s many romance fans while tackling the serious issue of racism in our not-so-distant past. An unforgettable romance in an unforgiving time. He’s a hometown native, returning from the war, determined to change the world he’d fought to protect. She’s the girl who’s been his secret friend since childhood, now a beautiful woman. Her war-time letters kept him alive. But he’s black, and she’s white. In 1946 in Gideon, Texas, their undeniable love might get them both killed. That now-grown bird whistled in merry greeting at a figure on the road, indistinct in the twilight. But Angel didn’t need to see his face to know it was Isaiah, partly because Ebenezer wasn’t friendly with that many humans, but mostly because she recognized his rolling, graceful walk. She looked back at her garden, her mouth setting. He joined her without a word, standing a few feet away. Angel moved the sprinkler slowly, back and forth, back and forth. Neither of them said a word for long moments. She lifted one shoulder in a shrug. She laughed quietly. “After a fashion,” she agreed, and let herself look up at him. They stood several feet apart. Ebenezer whistled between them on the ground as he pecked at worms soaked out of the wet earth. Isaiah’s eyes were grave and kind and steady, and there was suddenly between them a sense of knowing and history; all the Isaiahs she’d known melded into this one man, with his elegant bearing and rich laugh and troubled heart. “I believe I could use a cup myself,” he said. “First, you always figure a gun is loaded.” He flipped open the chamber and took the bullets out, piling them carefully on the oilcloth, then held the gun out toward her. “Go on. Get the feel of it. It was a lot heavier than it looked, and it took both hands to hold it steady, but once she had it straight, she squared her shoulders. Isaiah showed her the mechanics, how to line up a shot, how to fire. His arm brushed her shoulder, his chest was warm behind her, and she knew she would think about it later. For now, she listened, practiced with the empty gun, tried to get the feeling of it. There was tenderness in his eyes as he looked at her, and she knew that the bruises were visible here, in this light. “You got that right.” He illustrated the carriage return and the shift key. Angel slipped a piece of paper into the carriage and sat down in front of him to try typing a line. He stood behind her, smelling the mix of sweat and oranges that came off her skin, noticing her small, well-formed head and the fine wispy hair. He thought of moving her hair off her neck, putting his nose to the damp place at her nape. He knew she would not turn away. And then they’d both end up dead, or worse. “You gettin’ the idea,” he said, and moved toward the sink, drinking his coffee. “I know there’s a way to type with all your fingers. Do you know how?” She pursed her fat little lips. The bruise on her cheek made his head ache. Even to his own ears, his voice was gruff. “We can’t be buddies, Angel, and you know it.” But he came close enough to take the paper. He was reminded suddenly of her stubborn, almost unshakable will. Sometimes as children they had clashed, but Angel never got angry and shouted. Instead, her voice would drop and steady, and his argument or wishes would melt under her relentless reasoning. He quelled an amused quirk of his lips, because even anticipating it would have fueled the fire. He propped a leg on the stair near her foot and said nothing, knowing she’d talk. He thought of the wasted landscapes he’d seen as he searched for Gudren, thought of the bombed churches and endless rubble that tanks and mortar fire and bombs had left behind, thought of entire miles of scorched trees. He thought of the hungry, aimless children, hordes of them orphaned by war, and the camp refugees traveling in small knots, fleeing the broken spine of Europe. He thought of Berlin and Paris and London, the legendary cities of their childhood, all of them tattered and stomped and littered with the refuse of battles, like the souls and hearts of the people who remained. “No. Whatever it was before is gone,” he said at last. “They’ll fix the streets and replow the fields and build up the churches. Twenty years from now, there’ll be children who don’t remember. But as long as people live who saw it…” He halted, the words crowded from his throat as he thought of the children. The widows. The dead animals in zoos and along the road—lions and bears, spaniels and tabbies. The walking skeletons, the bare heads of refugees. Her dry hand touched his under cover of night, her paper-dry fingers covering his knuckles. Without looking at her, he turned his hand over and met her, palm to palm. “I imagine God won’t mind if you can’t believe in him for awhile,” she said quietly. He squeezed her fingers in appreciation, but didn’t speak. A long time passed just like that, Isaiah standing there with her hand clasped on his knee, Angel sitting on the step.